A left-handed pitcher who batted from the right side, Johnny Schmitz enjoyed a good time in baseball, though a four-year hitch in the US Navy during World War II interrupted a career that was just getting started. He was signed originally before the 1938 season (almost certainly in 1937) by Lou Nahin and Harold Schiefelbein for the Milwaukee Brewers of the American Association, a team that had a working agreement with the Cleveland Indians.1 Only 17 at the time, he was placed with the Hopkinsville (Kentucky) Hoppers of the Class-D Kitty League (the Kentucky-Illinois-Tennessee League). He pitched 110 innings in 21 games and finished the year with a record of 11-2 and a 3.44 ERA. The team finished first in league standings. The working agreement with the Indians expired, and Schmitz’s contract was assumed by the Chicago Cubs prior to the 1939 season. He was in the Cubs organization into 1951. Schmitz was born in Wausau, Wisconsin, on November 27, 1920, the son of two Wisconsin natives, Otto and Marie Schmitz. All four of his grandparents had come to the United States from Germany. John Albert Schmitz was the second of Otto and Marie’s six children. Otto Schmitz worked in a paper mill at the time of the 1930 census. Ten years later, he listed himself as a laborer. Schmitz spent most of 1939 playing with the Bloomington (Illinois) Bloomers in the Class-B Three-I League. He was 14-12 with a 4.02 ERA. Brooklyn Dodgers scout Dan McGrew called him “the best young left hander I’ve seen since I first watched the late Rube Benton. Schmitz has a great curve.”4 Schmitz also pitched in two games for the Double-A Brewers, and lost them both. Schmitz’s 1940 season was spent playing for the Three-I League’s Madison Blues, in Wisconsin. He threw 222 innings, with a record of 15-14 for a sixth-place team but with a very good 3.28 earned-run average. He was one first-place vote short of being named to the All-Star team. He also pitched three innings for Milwaukee, giving up four earned runs. Schmitz’s major-league debut came in Pittsburgh on September 6. Cubs manager Jimmie Wilson brought him into the game to pitch the seventh inning in a game the Pirates were winning, 6-2. Schmitz faced six batters and threw two hitless innings. The Cubs scored twice in the top of the eighth, but the scoring ended there. At Wrigley Field on September 10, with runners on first and second and only one out, the Dodgers just having taken a 4-2 lead, Schmitz was called in, faced one batter (Cookie Lavagetto), and induced a double play. Though he himself was removed for a pinch-hitter, he saw his Cubs teammates score three runs in the bottom of the ninth, and thus earned his first major-league victory. In the second game of a September 14 doubleheader against the visiting Boston Braves, Wilson gave Schmitz a start and he came through with a complete-game five-hitter, winning 10-3, with only one of the runs an earned run. He started and worked seven innings on the 20th in St. Louis, charged with two runs, but no decision in a 7-3 victory over the Cardinals. His final game of the year was one he had to leave after three innings, despite not giving up a run. His big-league line at the end of the season was 2-0, 1.31 in 20⅔ innings of work. Schmitz was a good fielding pitcher. He had handled 50 chances for the Brewers in 1941 without committing an error. In his first 115 chances in the majors, 1941 through 1946, he made only one, and in 1951, 1952, and 1955 he was error-free. His lifetime fielding percentage was .963. There were other years, 1948 and 1950, when Schmitz led all pitchers in assists. In 1942, the Cubs finished in sixth place, 38 games out of first. Schmitz had 10 starts and worked in 13 games as a reliever. His ERA was 3.43, but his won-lost record was 3-7. In only one game did he give up more than four runs (on July 5 in St. Louis, he gave up five and lasted only a third of an inning). There were some hard-luck losses, too, such as the 4-3 complete-game 10-inning loss to the Dodgers on June 7. His last game of the year was on August 1. It was also his last pro game for the duration of the war; immediately after the game he reported for induction. Pitching for Charlie Grimm’s 1946 Chicago Cubs, Schmitz was given 31 starts and became an All-Star. His record for the year was 11-11, but his 2.61 earned-run average was a strong one, sixth in the league. His 135 strikeouts led the league. He threw two 1-0 shutouts, against the Dodgers and the Cardinals. He won another 1-0 game, too, though needing relief after 8⅓. One of his losses was in a 13-inning complete game that he lost, 3-2. He was error-free in the field. Schmitz had a good 3.22 ERA in 1947, ranking 10th-best in the National League, but wound up leading the league in losses, 13-18. In eight of his losses, the Cubs scored two or fewer runs. He flipped the won-lost record to 18-13 in 1948, and Schmitz was again an All-Star. He finished 12th in MVP voting. His ERA was 2.64. The only All-Star Game in which he pitched was the one in 1948, at Sportsman’s Park, St. Louis. Schmitz took over in the top of the fourth, leaving after getting only one out, and being charged with three runs and the loss. Before the 1948 season began, Schmitz became engaged, planning to marry Aglie Schumacher of Wausau in the fall. Come fall, the wedding seems to have been rather private. The names Schumacher and Schmitz don’t turn up together in news stories after the time of the January engagement. A note in the Chicago Tribune in February 1951, however, said that Schmitz “met his first born just a month ago.”9 After his death, we learn that a son and a daughter both survived him. The 1949 Cubs finished in last place. With 11 victories (he was 11-13), Schmitz was the winningest pitcher on the team, though he might have won more if he’d pitched better. His ERA dropped from 2.64 to 4.35. Again, there was a lack of run support; in seven of Schmitz’s losses, the Cubs scored two or fewer runs. His best game of the year came on August 4 against the New York Giants when he had a no-hitter going into the eighth, and still won a three-hit 1-0 shutout. Frank Frisch had taken over for Grimm about a third of the way into the 1949 campaign. The Cubs nudged up one rung on the ladder in 1950, to seventh place. Schmitz declined in effectiveness, his ERA climbing to 4.99. Bob Rush was a 20-game loser, but he won 13 to Schmitz’s 10 (with 16 losses). 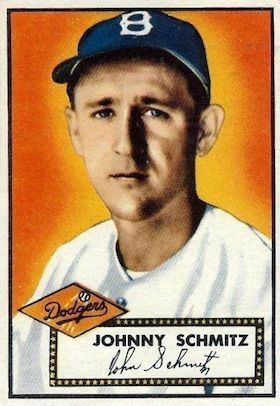 Years later, in early 1956, Schmitz said he’d hurt his arm at some point in 1949.10 There was another one of those heartbreakers for Schmitz, when he pitched into the 13th inning on April 30, 1950, in St. Louis, only to lose a four-hit gem, 1-0, the fourth hit, a solo home run by Del Rice. Harry Brecheen went the distance to get the win for the Cardinals. Schmitz threw two shutouts in May, and was 8-3 as late as June 25, but he slid as the season went on, dropping nine of his last 10 decisions. The trade on June 15 was an eight-player deal, with Andy Pafko being the big name leaving the Cubs. Wayne Terwilliger, Rube Walker, and Schmitz also were sent to Brooklyn. Bruce Edwards, Joe Hatten, Gene Hermanski, and Eddie Miksis came to the Cubs. “We had to do something,” said Frisch, whose Cubs had lost eight of nine. The Tribune simply said of Schmitz that “Hatten, like Schmitz, has been ineffective the last two seasons.”12 Schmitz was 1-2, with an 8.00 ERA at the time of the trade. He didn’t get much better. He was 1-4, with a 5.34 earned-run average for the Dodgers. His inclusion in an early March 1952 story from the Associated Press didn’t show much hope that Schmitz would turn things around; the story was entitled “Ex-Stars’ Glory Road Turning into Dead End.”13 In fact, he did improve. Never again did he finish a year with an ERA above 3.71 – that was his ERA both in 1952 and again in 1955. At the end of July 1952, though, Schmitz was 4.32. He’d appeared in only 10 games and, wrote the New York Times, he “did not seem to have his stuff.” He was placed on waivers, and none of the National League teams bit, but the New York Yankees paid the $10,000 waiver price, and Schmitz left Brooklyn for the Bronx. The transaction brought Schmitz to a pennant-winning club. In fact, by the time the 1952 season was over, the Dodgers had won the pennant, too, in their league – and the two teams faced each other in the World Series, the Dodgers taking it to Game Seven but losing to the Yankees. By then, Schmitz wasn’t with either team. He appeared in five games for the Yankees, starting two. He won one and he lost one. And on August 28 he was sent back to the National League, part of a deal in which the Yankees sent four players and $35,000 to the Cincinnati Reds to get pitcher Ewell Blackwell. It was an unusual deal, but went through because no National League club was willing to pony up the waiver price for Blackwell; the Dodgers were more or less 10 games ahead of everyone else in the NL standings. Schmitz wasn’t used much by the Reds – just five innings in three appearances. But he did finish the season with the combined 3.71 ERA. After being with the Cubs for his full career, more than a decade, Schmitz had now been with three other clubs in the space of one season. And then he was brought back to the Yankees, purchased from the Reds on February 16, 1953, to give them a left-hander after they had determined to send Joe Ostrowski to Los Angeles in the Pacific Coast League. This stay with the Yankees was even briefer – Schmitz worked a total of 4⅓ innings in three appearances before being claimed off waivers by the Washington Senators on May 12, as the Yanks tried to get down to the 25-man roster limit. Finally, Schmitz found a new home, at least for a couple of years. He pitched reasonably well the remainder of 1953, with a 3.68 ERA, but his won-lost record was an unfortunate 2-7, despite the Senators finishing in fifth place. In 1954 Schmitz had a very good year. He worked as a regular, starting 23 games and pitching to an ERA of 2.91. He had a winning record, 11-8. He reminded the Yankees that he could still bring it, shutting them out 1-0, on only three hits, on May 31. He shut them out again in 1955, a five-hitter on July 3, in two of the three shutouts he had as a Senators pitcher. And he could match up with the best, at times, such as the 10-inning complete-game win over Bob Feller and the Indians on August 27, 1954. The Senators were open to offers for Schmitz, and most of the rest of the team, but he was back with them again for a second full season in 1955. He didn’t have a winning record, at 7-10, but Washington was a last-place team with a 53-101 record. Schmitz’s ERA was a solid 3.71. Schmitz was hampered by a foot infection during spring training. “I’m like an eight-cylinder auto with flat tires,” he said while laid up.17 He got into a couple of games for the Red Sox in relief, throwing 4⅓ innings, giving up five hits and two runs (neither one earned). On May 14 he was purchased by the Baltimore Orioles. Schmitz worked the rest of the season for the Orioles, starting three games and relieving in 15 others. He kept his ERA under 4.00 – just barely; it was 3.99. His won-lost record was 0-3. On October 17 he was released by the Orioles. His big-league career was over. He finished with a lifetime mark of 93-114 with a good 3.55 earned-run average. As a batter, Schmitz had never been much, though he contributed from time to time. He’d actually been used as a pinch-hitter by Bill Veeck when both had been in Milwaukee. “But I might add,” Veeck said, “that we finished last by 15 games and it didn’t take too much talent to do anything on our club.”18 In fact, Schmitz hit for a .264 average for the Brewers in 1941, but in the major leagues his career average was .141. He homered twice in his career and drove in 32 runs. Schmitz gave it one more year, pitching in the Triple-A International League for the Toronto Maple Leafs. His record was 7-9, 3.30 ERA. There was one notable game, on June 25 when he pitched a 3-0 shutout of the Columbus Jets, a game that took only 90 minutes to play. Schmitz threw 91 pitches in the game.19 Later that year, he left the game of baseball and began work as a greenskeeper at Wausau American Legion Golf Course. He hadn’t entirely given up on playing ball. In 1958, it was noted that he pitched for the Wausau Bakers in the semipro Wisconsin Valley League. Schmitz entered hospice care and was at the Asera Care Hospice at Weston, Wisconsin, where he died on October 1, 2011. All his siblings predeceased him. His son, Barry, daughter, Janey, and numerous family members survived him. In addition to the sources noted in this biography, the author also accessed Schmitz's player file and player questionnaire from the National Baseball Hall of Fame, the Encyclopedia of Minor League Baseball, Retrosheet.org, Baseball-Reference.com, Rod Nelson of SABR's Scouts Committee, and the SABR Minor Leagues Database, accessed online at Baseball-Reference.com. 1 Information submitted by John Schmitz in a questionnaire returned to the SABR Scouts Committee, on October 14, 2002. 2 Sam Levy, “Brewers Know All About Rookies Except if They Can Make the Grade,” Milwaukee Journal, February 27, 1938: 24. The January 11 edition of the paper listed Schmitz among those who had already been signed. 3 “Johnny A. Schmitz,” Wausau Daily Herald, October 6, 2011. 4 “Baseball,” Milwaukee Journal, September 1, 1939: 37. 5 “Schmitz,” Milwaukee Journal, September 3, 1941: 22. 6 “Navy Releases Schmitz; Ready to Rejoin Cubs,” Chicago Tribune, January 8, 1946: 16. 7 Associated Press, “Great Lakes Beats Cubs at Davenport,” Daily Nonpareil (Council Bluffs, Iowa), June 8, 1943: 8. 9 Edward Burns, “Cub Special Sounds Like Daddy Clinic,” Chicago Tribune, February 23, 1951: B2. 10 Harold Kaese, “Schmitz’s Indian Sign on Power Hitters May Help Red Sox in Pinch,” Boston Globe, March 23, 1956: 34. 11 Sam Levy, “Schmitz Should Have Good Year with a Little Control,” Milwaukee Journal, January 16, 1951: 31. 12 Edward Prell, “Sox Lose 2; Cubs Swap Pafko, 3 Others,” Chicago Tribune, June 16, 1951: B1. 13 Associated Press, “Ex-Stars’ Glory Road Turning into Dead End,” Chicago Tribune, March 9, 1952: A6. 14 Joe Cashman, “Who’s New on Sox: Schmitz Bullpen Ace,” Boston Daily Record, November 29, 1955: 37. 15 Dave Egan, “Majors Rig 5th Flag for Yanks,” Boston Sunday Advertiser, February 22, 1953: 15. 16 Harold Kaese, “Porterfield and Vernon Give Sox More Depth,” Boston Globe, November 9, 1955: 1. 18 Evening Star (Washington), June 4, 1953: 64. 19 Neil MacCarl, “Schmitz Fires Fast to Beat the Clock and Well as Leaf Rivals,” The Sporting News, August 21, 1957: 43. 20 “Johnny A. Schmitz,” Wausau Daily Herald, October 6, 2011.